The Greater Manchester Mayoral Election during the local election period of May 2017, was a particularly interesting one. Despite strong Conservative gains nationally, this was not reflected in the Greater Manchester vote. The Labour Party win was a white wash and even areas that traditionally had leanings towards the Conservative party did not show a strong Conservative turnout. What was also seen was that, particularly in the case of the Manchester Central district, deprivation or affluence is a very poor indicator of voting intention as both poor and wealthy areas voted almost exactly the same. This tells us that both parties may have opportunities well beyond their traditional bases, as has been seen with Conservative incursions into Scotland. As of 16/05/2017 polling suggests that the 2017 general election is going to produce a huge gain for the Conservatives. Moving from 331 seats to 410 seats and seeing Labour drop from 232 to 166. It seems that most pollsters agree this is the current trend and that Labour simply have not made progress in recent times to catch up. If so this will produce a significant majority and one that will allow the current government’s vision for Brexit to come to fruition with an opposition that will be significantly weakened. The Mayoral result was a complete landslide and that was certainly not out of the blue, the region has been a Labour heartland throughout the 20th and 21st century. However, the magnitude of the Labour win was at odds with the current trends towards the Conservative Party that we are seeing nationally. Andy Burnham was the Labour candidate and now Manchester Mayor and he returned 63.4% of the first vote compared to the Conservative vote of 22.74%. Whilst in Greater Manchester the Manchester local authority contains the most deprived areas, this is not necessarily the reason behind the way that people vote. Traditionally, working class and poorer areas would swing more towards Labour and more wealthy middle and upper class areas towards the Conservatives. However, what we saw in the Manchester mayoral election is that when this is broken down to ward level, in many cases there is little correlation between how economical poor a ward is and the way it votes. 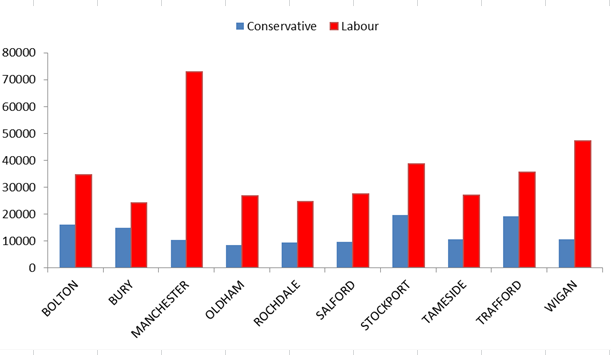 Considering the size of the national trend, we would have expected to at least see some marginal Conservative strength in some areas of the Greater Manchester region, but there was next to nothing.